My United States Representative, Chet Edwards has been perhaps the strongest advocate for religious liberty in Congress over the past decade. On Saturday, Chet will receive the Abner McCall Religious Liberty Award at Baylor University. Past winners include (1998) Dr. James Dunn, former executive director of the Baptist Joint Committee on Public Affairs in Washington, D.C.; (2004) Dr. Edwin S. Gaustad, a 1947 Baylor graduate and noted scholar in religious history in America; and (2005) the late John F. Baugh, founder of SYSCO Corp. and Baylor Alumnus Honoris Causa, who served on the Baylor Board of Regents and received the Founders Medallion, one of the most distinguished honors presented by Baylor. The Baylor Alumni Association will present the Abner V. McCall Religious Liberty Award to U.S. Rep. Chet Edwards, during Baylor University's winter commencement ceremony at 10 a.m. Saturday, Dec. 15, at the Ferrell Center. The award honors alumni or friends of the university who, by their lives and actions, have exemplified the courage and dedication of the late Baylor President Abner V. McCall to the belief in and commitment to religious liberty. Edwards was elected in 2006 to his ninth term as the congressman representing the 17th Congressional District of Texas, which includes Baylor. As a lifelong person of faith, he has led Congress in the protection of religious liberty by opposing attempts to insert federal influence into the practice of individual faith and by seeking to keep government funding and regulations out of our churches and houses of worship. For these efforts, Edwards has received numerous recognitions, including the 2006 National First Freedom Award, the 2005 T. B. Maston Christian Ethics Award, the Jordan/Hatfield Courage Award from the Baptist Joint Committee, the Interfaith Alliance Walter Cronkite Award, the Anti-Defamation League's Religious Liberty Achievement Award, the 2003 Associated Baptist Press Religious Freedom Award, and the Congressional Leadership Award from the American Jewish Committee. 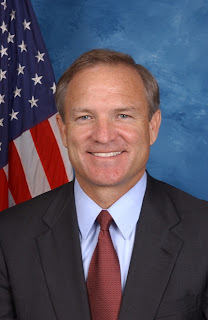 A 1974 graduate of Texas A&M University, Edwards worked three years for U.S. Rep. Olin E. "Tiger" Teague, before earning an MBA from the Harvard Business School. In the 1980s, he worked in commercial real estate and was owner and president of Edwards Communications, a rural radio station. From 1983-89, he served in the Texas Senate, where he was named one of Ten Outstanding Legislators by Texas Monthly magazine. Edwards and his wife, Lea Ann, along with their sons, J.T. and Garrison, attend Calvary Baptist Church in Waco. Come over and help me get Mike Huckabee elected and forget all this Religious Liberty stuff. You know it is never going anywhere. Great news and a well-deserved award! Well deserved for sure. Chet is te best advocate for Religious liberty among our nation's elected leadership. Cheers to you Weave for your article ppublished in the BJC newsletter. It is good stuff. Edwards had to reschedule at the last minute to be in D.C.
Award presentation will be rescheduled. Weav, Enjoy your holiday with the whole clan. Be alert for when this will be rescheduled as a stand alone event by the BAA. Mike Huckabee - The Republican Howard Dean?